I heard about this book from Lovely Books. This is a story about Hope, a healer who helps heal patients at a hospital. 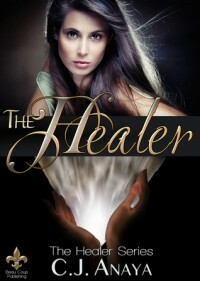 Her father is a doctor and her job there is a janitor, but she sneaks her healing powers in when no one is looking. Her father is paranoid about 'someone' finding out about Hope, so she has to hide her powers. When two handsome new boys show up at school, she is drawn to them both. But who are they really? This book was easy to read and very engaging. It is part 1 of a series, so keep that in mind. A good first book. I liked the Japanese mythology as well.